Whether you’re buying the king single mattress for yourself, for your child, or for a guest room, it’s always the ultimate treat to have a cosy bed to return to every night. At Brosa, we understand that not everyone has the same sleeping habits, which is why we offer three varieties of king single mattresses. 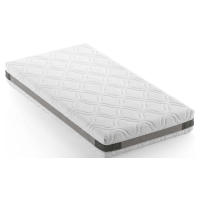 You have the choice of a firm mattress, a soft mattress, or a supportive mattress in between the two. Our king single mattresses are the perfect option for guest rooms or children’s bedrooms. Such a comfortable arrangement will have your guests coming back for more and your children just begging to stay in bed! With our range of mattresses, you’ll be investing in the greatest quality with an Australian-made product. Our mattresses are made from top quality adaptive foam materials to ensure you get the best night’s sleep possible. If you’re not happy with our mattress within 30 days, you’ll receive a full refund and we’ll collect the mattress from your door. All our mattresses come with a 10-year warranty. Shop our range of king single mattresses online today and you’ll enjoy fast deliver and 30 day returns!